Album of the Year!!!! Hands down. Within the first 15 seconds of the first song I knew that I was in for a special treat and boy was I right! 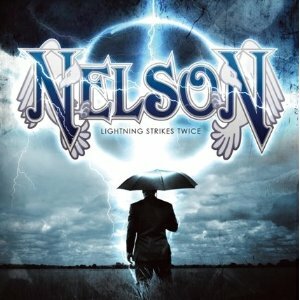 Nelson’s “Lightning Strikes Twice” is a ride from beginning to end and when it’s over just eaves you begging for more. One thing the Nelson brothers have always delivered is top notch songwriting and amazing harmonies and on “lightning” they take all that to the highest level possible. 1. Call Me– A Great opening track, Amazing harmonies, monster chorus. This is what melodic rock is all about!! 3. Ready, Willing and Able– Big party anthem!!! Some great fun blues rock! 4. How Can I Miss You (When You Won’t Go Away? )– Possibly the song of the year. Starts off slow and moody and you think your going one way but suddenly… BAM!!! It’s time to rock!! Monster Chorus! 5. You’re All I Need Tonight– The first single of the album. I loved it the first time I heard it, but when I heard it in the context of the entire album it just made it so much better. 6. To Get Back To You– A really beautiful power ballad. Guitar solo performed by the great Steve Lukather. 7. When Your Gone– Matthew Nelson really does have an incredibly distinctive guitar sound and it’s firing in all cylinders. More amazing harmonies. 9. Come– I am not quite sure what to make of this song. Perhaps my dirty mind is just making an innocent song into something filthy. A fun song nonetheless. 11. Change A Thing– Another kind of 90’s Gin Blossoms or Goo Goo Dolls type rocker. 12. Kickin’ My Heart Around– A moody hard rocker. A nice way to end the album. Definitely the heaviest song on the album. WIth this album, the Nelson brothers tried to go back to their roots and recapture the spirit of their debut album, hence the title “Lightning Strikes Twice”. Not only have they succeeded in that as this is indeed style wise very similar to their marvelous debut “After the Rain”, but with “Lightning Strikes Twice” they have managed to not only surpass their own brilliance but managed to make what is quite possibly one of the greatest melodic rock albums ever! !